Do you enjoy the sounds and sights of Christmas? 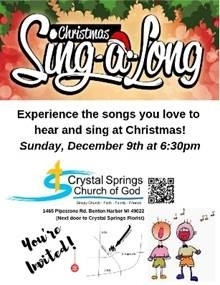 You’re invited to experience the songs you love to hear at Christmas by joining your friends at Crystal Springs Church of God for Christmas Sing-A-Long! This family fun free event will start at 6:30 pm with snacks and goodies after the program. The church is located at 1465 Pipestone Road next door to our friends at Crystal Springs Florist. Check out www.crystalspringsfamily.com for more information or call the church at: (269) 925-1843.